Although the first half of the month is consumed by the school holidays, October is relatively quiet on the domestic travel front as most South Africans are waiting for summer and the festive season to kick off. This means that the second half of the month, or at least from the 8th of October onwards, is a great time to score a bargain flight. Look out for cheap flights highlighted in green below. Try to avoid travelling on the 7th, the day before the school holidays end, and other dates highlighted in pink below. Kulula Johannesburg to Cape Town : Budget-conscious travellers should try to travel towards the end of the mont. Kulula Cape Town to Johannesburg : Avoid travelling on the 7th as the school holidays draw to a close and has clearly increased flight prices. Kulula Lanseria to CPT : Travellers can save over R1000 by booking flights highlighted in green as opposed to those highlighted in pink. Kulula CPT to Lanseria : Prices are extravagantly expensive on flights departing on the 6th and 7th of October. Kulula Johannesburg to Durban : Affordable flights are easy to find on this route, especially after the first week. Kulula Durban to Johannesburg: Budget-friendly flights are easy to find after the school holidays end on the 8th of October. 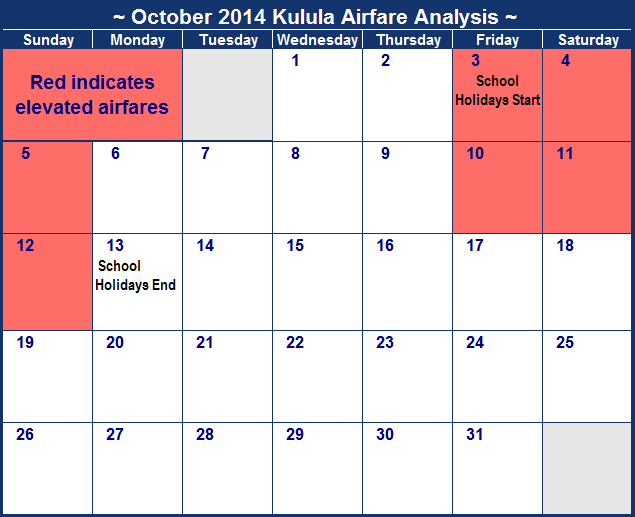 Kulula Lanseria to Durban : By avoiding dates highlighted in pink, you can easily save R400. Kulula Durban to Lanseria : Prices are incredibly consistent throughout the month, with the only dates to avoid around the 7th and 8th. Kulula JHB to George : Sunday flights are surprisingly affordable on this route. Kulula George to JHB : Try to avoid travelling during the first two weeks of the month. Kulula CPT to Durban : Cheap flights are available throughout the month and easy to spot as they're highlighted in green. Kulula Durban to CPT : Travelling after the first week of the month is considerably more affordable, especially after the school holidays have drawn to a close. Kulula JHB to East London : Affordable flights are readily available throughout the month, but Friday flights are generally more expensive. Kulula East London to JHB : Budget-conscious travellers should avoid travelling on the 7th if possible. October officially marks the down-hill decent to the end of the year, but before we say adios to 2017 we've still got to have a Halloween celebration and welcome the warmer weather. The start of October is also dominated by the school holidays, which only comes to an end on the 8th. This causes flight price increases on the 7th and the 8th of October. Sunday flights are generally more expensive than weekday flights, so where possible try to arrange flights either before or after the weekend. If you are on a budget, keep an eye out for dates highlighted in green and try to avoid dates highlighte in pink. Kulula Johannesburg to Cape Town : Prices are consistent throughout, just avoid the 1st week of the month if you are budget-conscious. Kulula Cape Town to Johannesburg : Sundays are by far the most expensive day of the week to travel. Kulula Lanseria to CPT : The difference between the most expensive flights and the cheapest flight is only R100. Kulula CPT to Lanseria : If possible, avoid travelling on the 7th and the 8th of October as the school holiday draws to a close and flight prices are inflated. Kulula Johannesburg to Durban : The first week is the most affordable week to travel this month. Kulula Durban to Johannesburg: There is no price difference between weekday and weekend flights on this route. Kulula Lanseria to Durban : Prices are only slightly elevated during the middle of the month. 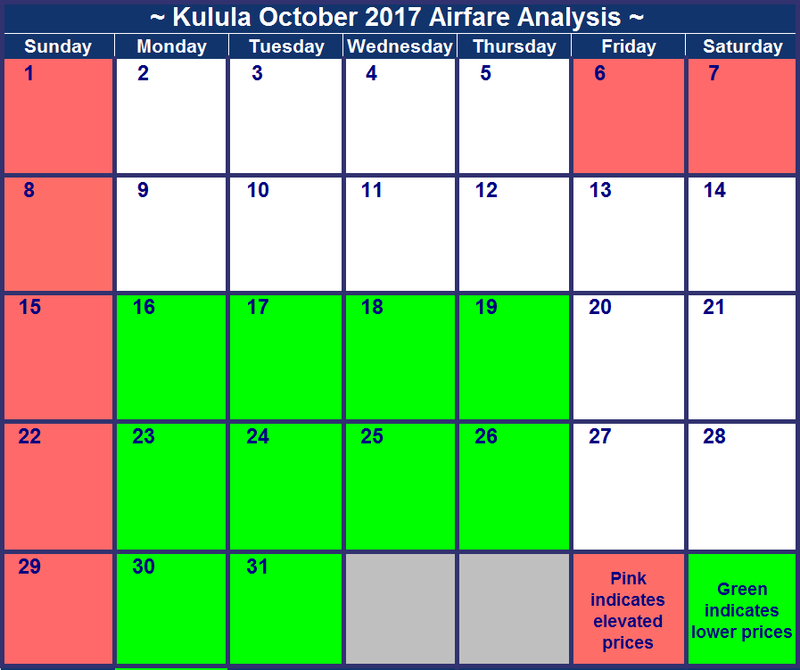 Kulula Durban to Lanseria : Prices are incredibly consistent throughout the month, with the only date to avoid the 8th. 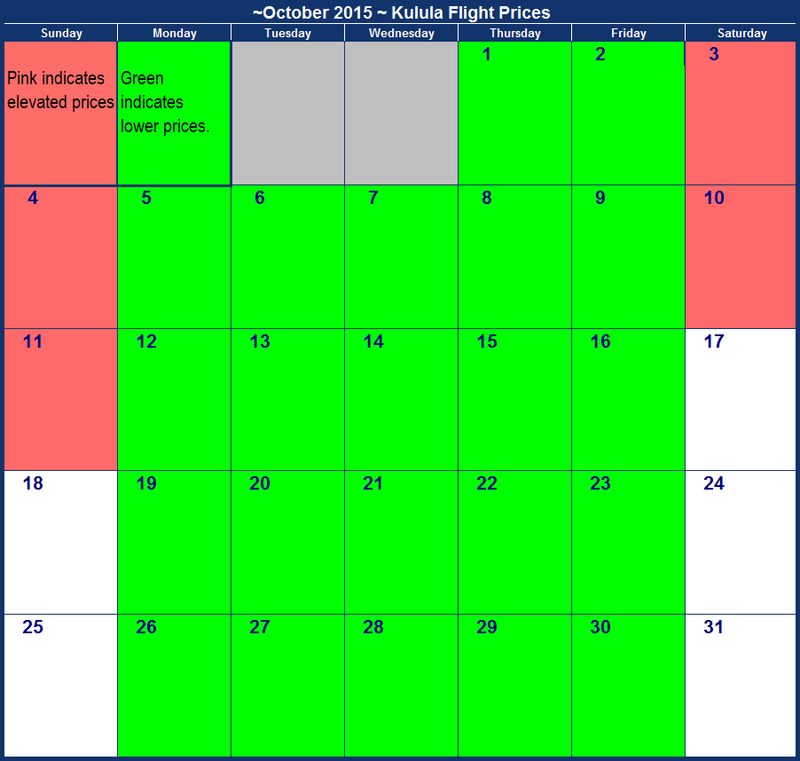 Kulula JHB to George : The cheapest days to travel on are highlighted in green below and no pattern is apparent. Kulula George to JHB : Sunday flights are by far the most expensive on this route. Kulula CPT to Durban : If you are travelling on a budget, look for dates highlighted in green and avoid travelling on the 8th of October. Kulula Durban to CPT : Mid-week flights are generally the most affordable option. Kulula JHB to East London : Flight prices are incredibly consistent throughout the month, with slight increases higlighted in pink. Kulula East London to JHB : Sundays are the most expensive day of the week to travel on. October is typically the quiet before the storm. With no public holidays or long weekends on the calendar this month, most families choose to stay home for the short school holidays. Unlike the December holiday right around the corner, the weather might still be cool but the lack of crowds and more affordable flights might make this the perfect opportunity for your break. The school holidays take place from the 1st of October until the 9th of October, making those some of the most expensive dates to travel on due to the high demand. Whether you need to blow off steam before the family arrives or simply want to explore a piece of our beautiful country without being surrounded by tourists, the prices below will help you plan the ultimate budget-conscious trip. Kulula Johannesburg to Cape Town : Prices are consistent throughout, just avoid the 1st of the month if you are budget-conscious. Kulula Lanseria to CPT : Prices are consistent throughout the month, with only slight peaks at the beginning. Kulula CPT to Lanseria : If possible, avoid travelling on the 9th of October as that is the most expensive date to travel on. Kulula Johannesburg to Durban : Surpringly, Saturdays are the cheapest day of the week to travel this month. Kulula Durban to Johannesburg: If possible, try to travel on Satudays as those are the most affordable. Kulula Lanseria to Durban : Irrespective of when you choose to travel, your price will be same as prices are consistent throughout. Kulula Durban to Lanseria : Avoid travelling on Sunday the 9th of October as it is slightly more expensive than other travel dates. Kulula George to JHB : Avoid travelling on the 8th and 24th if possible as flights on those dates are most expensive. Kulula CPT to Durban : In general you should avoid travelling on Sundays as prices are the most expensive, with mid-week dates being the safest to travel on. Kulula Durban to CPT : Avoid travelling on the 9th of October, the day that the school holidays end, as flight prices are most expensive then. Kulula JHB to East London : Avoid travelling on the first two days of the month as it is the start of the school holidays. Flight prices are very consistent throughout the month of October, with no public holidays and only a short school holiday. School holidays start on the 2nd and ends on the 12th of October 2015. Flight prices are obviously elevated on the 2nd, 3rd, 11th and 12th of October 2015. Kulula Johannesburg to Cape Town : Flights are the most expensive on the 2nd and 3rd of October, with flight prices relatively consistent throughout the rest of the month. Kulula Cape Town to Johannesburg : Avoid travelling on the 10th and 11th where possible. Kulula Lanseria to CPT : This route is slightly more affordable than OR Tambo, but you should still avoid the 2nd and the 3rd where possible. Kulula CPT to Lanseria : This route is very similarly priced to the Cape Town to OR Tambo route, with the same dates to avoid. Kulula Johannesburg to Durban : Avoid travelling on Saturdays where possible as those are the most expensive days of the week to travel on..
Kulula Durban to Johannesburg: Airfares fluctuate throughout the month, with the cheapest fare of R706 available on selected dates every week. Kulula Lanseria to Durban : Avoid travelling on the 1st of October and Fridays as those days are the most expensive on this route. Kulula Durban to Lanseria : Flight prices are consistent throughout the month, with the 10th being the marginally more expensive. Kulula JHB to George : Avoid travelling at the start of the month as those days are the most expensive to travel on. Kulula George to JHB : The 11th of October is the day to avoid as the price is nearly R300 more expensive than the rest of the month. Kulula CPT to Durban : In general you should avoid travelling on Saturdays and Sundays as prices are the most expensive, with mid-week dates being the safest to travel on. Kulula Durban to CPT : It is best to travel after the 12th of the month, when prices have settled. Kulula JHB to East London : If possible avoid travelling on the 2nd, 4th and the 10th, when airfares are the most expensive. Kulula East London to JHB : There are only two days to avoid travelling this month, the 10th and 11th of October 2015. October 2014 is more a month of dates to avoid rather than dates to try select. Most of the dates when airfares are higher than usual are on the weekend as school holidays starts and the weekend just before it ends. Unsurprisingly, airfares from Johannesburg to the coastal cities are elevated on the weekend that school holidays starts, and airfares from coastal cities (East London, George, Cape Town & Durban) to Johannesburg are higher than usual on the weekend that school holidays ends. A confused route is Cape Town to Durban, where airfares are elevated on both weekends. This is not an offer, merely a list of observations. This survey of airfares was conducted on the 25th March 2014. The more time that has elapsed since that date the greater the probability that the airfares listed below have changed. Navigate to Kulula Airline specials to check if there are any offers currently on the go, and check current airfares at www.kulula.com. Kulula Johannesburg to Cape Town : Airfares are elevated on the weekend that school holidays starts, as Gauteng holiday-makers jet down to the Cape coast. Kulula Cape Town to Johannesburg : Prices from Cape Town to Johannesburg are elevated on the weekend before school starts, when Gautengers return from the holiday in the Cape. Kulula Lanseria to CPT : Sam story for Lanseria to Cape Town flights, as for OR Tambo to Cape Town. Kulula CPT to Lanseria : Looks like more people want to return home to Gauteng on the Saturday than on the Sunday. Kulula Johannesburg to Durban : Airfares are elevated on the weekend that school holidays starts. Kulula Durban to Johannesburg: Airfares are elevated on the last day of school holidays, before the mad rush home. Kulula CPT to Durban : Cape Town to Durban is the most interesting of the routes, as it's not clear whether Capetonians are wanting to visit Durban or Durbanites are coming to Cape Town (probably both). All the prices below related to Kulula's airfares in October 2010, which were gathered on the 1st September 2010. These are now out of date and obviously cannot be booked anymore, but are retained on this page for historic reference purposes. Note that the airfares immediately above are from October 2010 (so no longer valid, but retained for research purposes). To see Kulula's October 2014 airfares, scroll all the way to the top of this page.